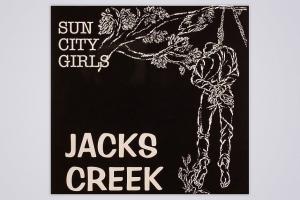 In the pre-Internet underground, few hyper-prolific collectives came more self-obscured than Phoenix’s Sun City Girls. Their 15th proper full-length since their early ’80s inception, 1995’s Jacks Creek had drummer Charles Gocher and brothers Alan and Richard Bishop deconstructing Appalachian twang into shards. Often threading characters (like Alan Bishop’s belatedly unhinged Uncle Jim) with raw ethno-psych, Jacks Creek quickly crosses from patois novelty shtick to primitive folk terror. Like Oddsac, it grows scarier when one tries to figure out why it’s funny. Geologist: Actually, we were going to see Pavement! Avey Tare: …And I was like all right, I wanna check this out. There was this one piece on it, “Gurnam.” It’s this long narrative of them improvising a story, talking to each other like these backwoods guys. It gets really scary. They bring in all these weird sounds in the background really subtly. So you’re like, “Is there a sound there or am I just making this into this weird haunted environment.” A lot of it doesn’t even make any sense, but you kind of make it into your own — whatever my mood was. I just assumed they were tapped into this thing I was tapped into. I guess cause Josh and I were into theater too in high school and it kind of fit that realm for me. It was part of our humor any way to talk to each other in weird voices and charcters.